In my last post, I discussed basic configuration and operation of WHS and now will review the native backup and recovery functionality. At its core, WHS is an automated backup and recovery system. It relies on the Windows Home Server Console (WHSC) to manage the backup and recovery processes. The console allows the user to easily schedule backup times and retention periods as pictured in the screenshot. However, it should be noted that these options are included in the “General Settings” section of WHSC and so all changes apply to every system protected. Thus it is not possible to have one system with a 3 month retention and the other a 6 month retention. Conveniently, WHSC can be configured to wake a Windows system from hibernation to run the backup. It would be even better if it could automatically enable hibernation after a backup is completed, but this does not appear to be supported. 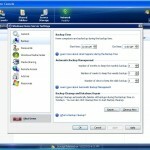 The basic functionality also allows the user to choose specific folders to backup. The process is wizard driven and is very intuitive. WHSC also intelligently excludes folders that hold temporary data and are unnecessary to protect. 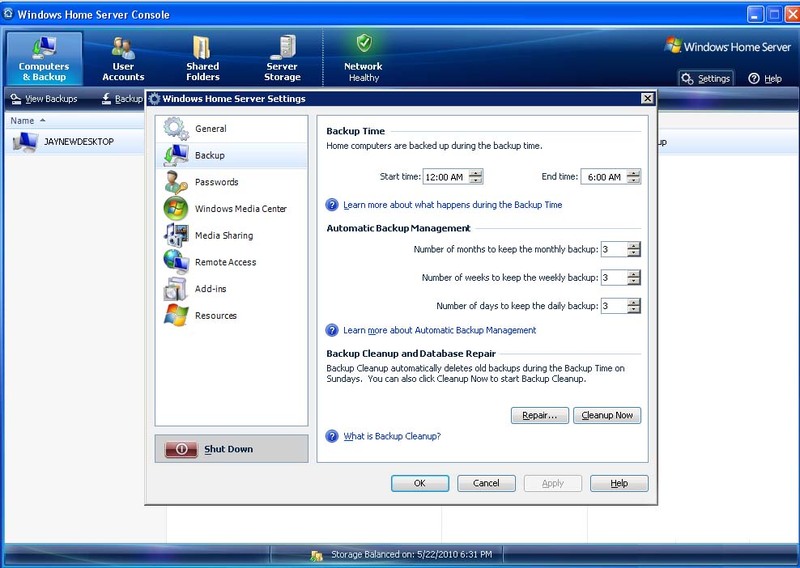 At a basic level, backups are triggered on scheduled basis via the settings pictured above or run manually. In either case, the system will conduct a scan of the selected folders looking for changed files to protect. The first backup can take quite a while and will push all data. Subsequent backups are much faster since only changed data is transferred. So long AT&T unlimited data, Verizon to follow? Their tethering option is similarly unattractive. It costs $20 on top of the DataPro plan, and worst of all, it uses the same pool of data. Thus your 2GB allotment applies to both your smartphone usage AND tethering! The current situation with Verizon Wireless is better. They continue to offer unlimited data for $29.99 (Update: “Unlimited” is actually limited to 5GB) , but have signaled that they will be moving away from this in the future. Their new pricing has not been shared, but you can bet that it will be similar to AT&T. I believe that this is a very troubling trend. The newest smartphone OSes like iPhone, Android and WebOS are designed for constant Internet connectivity and bandwidth will become even more important with new mobile technologies like video conferencing, video streaming and cloud-based applications. Unfortunately by increasing the bandwidth costs, carriers are limiting adoption of these services and stifling innovation. Raising bandwidth prices is a short-sighted strategy. Data usage will only increase and as it does customers will become more frustrated with rapidly growing bills. Ironically, increased usage presents an opportunity for a carrier to provide a better end user experience with fast wireless data and fair prices. The provider who gets this right has the potential to increase its market share and generate additional profits and revenues. Unfortunately, it appears that these two major players are adopting Jerry Maguire’s mantra of “Show me the money”; however this story is unlikely to have the same happy ending. I blogged earlier this week about the importance of a next generation smartphone OS and recently ran across this article over at the Wall Street Journal which reinforces the point. It discusses how multiple vendors are developing iPad competitors based on Android. The key is that Android is a next generation OS that provides the flexibility to support multiple hardware platforms. This is similar to how the iPhone was designed. The other element to consider is that Android is a truly open platform allowing for broad application support. In contrast, Apple tightly controls the availability and qualification of applications for the iPhone/iPad platform. The Android approach provides much more flexibility and openness at the expense of control. Apple tighly controls their environment and can and does limit applications that do not meet their standards or compete with existing functionality (think Google Voice). Consumers will vote with their wallet on the solution that they want. Clearly Apple has a big lead in the market with its early launch of the iPad, but the openness and broad vendor support of Android may allow for more aggressive competition. It will be interesting to see which technology emerges as the dominant one. For me, I always prefer openness and flexibility and so would be more willing to invest in Android over the iPad. The Mrs is looking to take the leap into the world of smartphones. Up until this point, she has used a traditional cellular phone and an old fashioned Palm Z22. The combination has worked okay, but the requirement for frequent manual syncing of the Z22 due to recurring data loss is frustrating. It is time for a change. As I am reviewing options, the realization has struck me that what really matters is the OS. I define the OS as not just the software that runs on the phone but also the supporting infrastructure. Apple has masterfully innovated through their iPhone OS and complementary applications such as iTunes and the AppStore. Apple created an entirely new and highly profitable business model with these products. They then ported the same technology to two additional platforms in the iPod Touch and the iPad and further extended their reach. In fact their OS and infrastructure was so revolutionary that they have made few changes to it since the launch in 2007 and it still is the leader.